(Daily Caller) A California State, Sacramento academic believes President-elect Donald Trump should be barred from using the Internet because he’s a global warming skeptic. “If Trump and his cohort believe the science of global warming is bogus then they shouldn’t be allowed to use the science of the Internet for their Twitter accounts,” Palermo wrote Tuesday in an op-ed for Huffington Post. Of course, it’s really more of computer science, the same thing ‘climate change’ is based on. However, Twitter works. The computer models from Warmists? Not so much. See, the problem here for Warmists, and Progressives overall, is that they do not like that people with differing views are allowed to express those views. Hence, they want those views shut down. This entry was written by William Teach and posted on at 12:14 pm and filed under Global Warming, New Climate Deniers. Bookmark the permalink. Follow any comments here with the RSS feed for this post. Just as soon as he stops using anything that requires fossil fuels to manufacture, power or feed his family….Ill take him up on his offer. As usual, the left runs on a different set of rules. 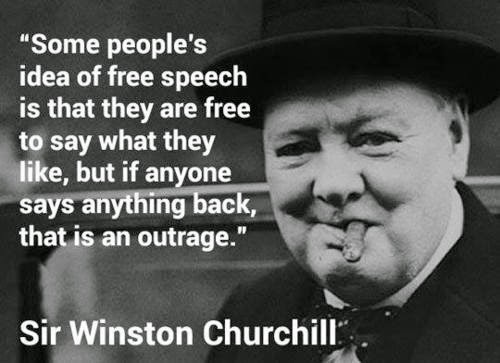 Libs are all about censorship. You don’t agree with them, they want you censored. They’d prefer you were killed outright, but you must be censored at the very least, “for the common good”. “Farenheit 451” has gone digital. Liam, there was one genuine leftist that did that. His name was Ted Kaczynski. The Unabomber. Lived in a shack, crapped in a pit, “resourced” his own urine. Killed people for the cause. Just another leftist radical killing deplorables who don’t agree with him. Nothin’ to see here.